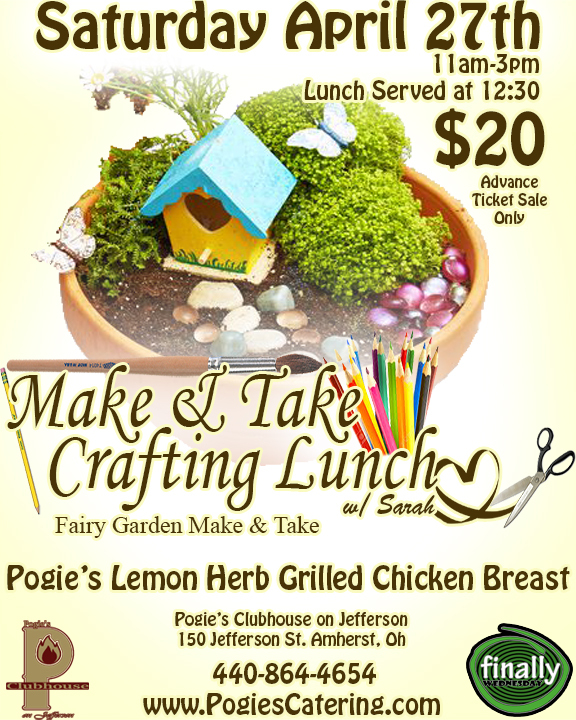 Pogie’s Clubhouse will host a Make & Take Crafting Lunch Saturday, April 27th at Pogie’s Clubhouse on Jefferson in Amherst. 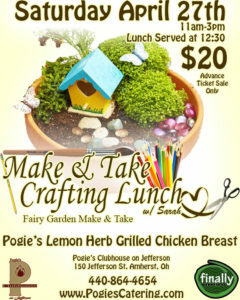 Come make a fairy garden to add to your potted spring plant display or as wonderful indoor potted display. Professional Crafter, Sarah Stout will guide the day and all materials will be provided but if you have a piece or mini plant, you’d like to add to your fairy garden, feel free to bring it along. A fairy garden pot, potting soil, and a variety of fair garden embellishments to choose from will be provided for a personalized Fairy Garden that will be uniquely yours. Make & Take Crafting Lunch Facebook page!